Keeping a close eye on the little one. 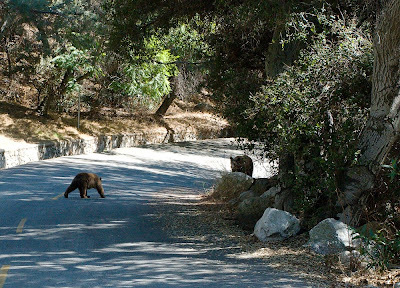 I ran into a mother bear with two cubs on this road (if it's the road up to and beyond Trask). I thought I was in deep sh*%@#$. I started backing up. Fortunately, she and the cubs kept on walking in the other direction. This is just above the turnoff to Trask heading up to the nature center. Wild bears are an amazing thing to see but a mother with cubs can be the most unpredictable and dangerous. This photo is from back in 2005. These two were well known in the area. Mother bear was called Little Girl. She had two cubs, a girl called Spirit and a boy called Rowdy. I think the one in the photo is Spirit.